Can anyone offer some guidance on how to change the look of the Search Results page? Right now there is no visual separation and everything looks very condensed and cluttered making it hard to view. I have attached a screenshot to help illustrate the areas of concern and improvements. Any help you can give would be so helpful as I cannot find help anywhere. 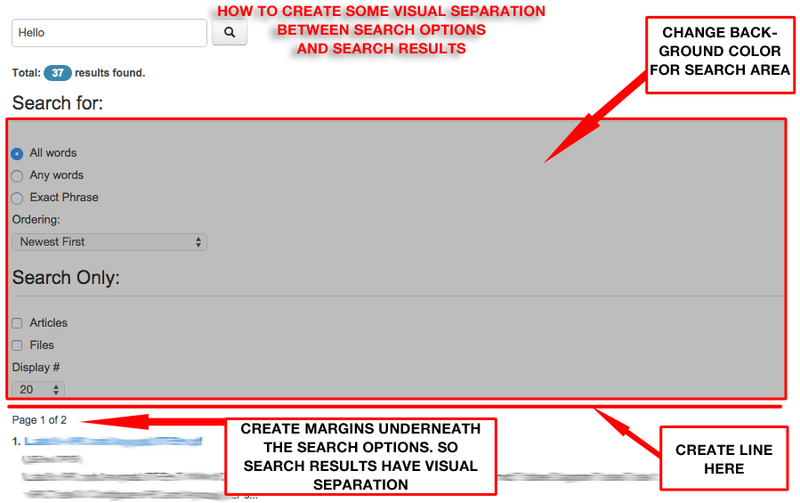 I have tried Firebug to change margins below, but it changes the margins on other things I do not want. I like the look of the "Smart Search" results page better because it has better visual separation but like the functions of the normal "Search" Plugin. Any suggustion on how to customize Search results page (possible search result templates)? **NOTE: I have very limited experience with CSS, PHP. So please be specific as you can with suggestions. The best way for make this changes is making an override. Best option will be if you use Mozilla Firefox, and then install the add-on extension WebDeveloper. That extension will help you a lot with discovering where are you on your HTML code, which CSS class/id is assigned to that specific line, and then easily you can edit your CSS code and see in "live" what you are getting by changing parameters. At the same time if you need to modify layout itself, then I suggest overriding existing template. But for visual effects only, CSS and WebDeveloper extension will help you a lot. Not the answer you're looking for? Browse other questions tagged css layout search or ask your own question. How to include the Smart Search box in my home page? How change default search setting from “all words” to “any words”?